The early spring is always a tricky time for cooking, in that the climate inspires a retreat from the rib-sticking stuff you want for insulation if you are running the Iditarod, or waiting for the #66 bus, yet the vegetables have yet to appear. This soup has the advantage of concentrating the flavors of the sub-par veggies available now into something that tastes like summer. It is important to listen to Shuggie Otis while you make, chill, and consume this soup. It is a riff on a soup from Bittman's The Minimalist Cooks at Home, a very useful tome, but the refinement of roasting the cantaloupe is a difference maker. *If you live where they are, the house brand EVOO from Publix is really quite good for less refined uses. Cut the melon in half, scoop out the seeds, cut melon into slices and remove rind from melon. Put a generous slug or two of olive oil in a cast iron skillet, and swirl melon pieces around in the oil. Give another swirl in 10 minutes or so. While the melon roasts, prep tomatoes: use a paring knife to remove the core of the tomato (you will remove a cone shaped section, oriented around the north pole of the tomato), cut a shallow x in the bottom, and drop into boiling water for 30 sec., then dunk in ice water. Cut tomatoes in half, and work skins off under running cold water, and use the water to rinse out all the seeds--you will have to pull the tomato apart a bit as you do this. When the cantaloupe pieces are starting to lose structural integrity, and you have a nice slurry of olive oil and cantaloupe essence in the skillet, but before anything chars, turn the cantaloupe out into a bowl, leaving at least some of the slurry in the pan, and add the tomatoes, adding more oil if they threaten to stick. Cook tomatoes just enough so that they do not taste raw. When melon and tomato are cool enough to work with, combine with basil and some ice in a blender. Make sure you get all the slurry in there. You remembered to rinse the basil. Add some lemon, reblend, and check seasoning. Allow soup to chill, 45 min. 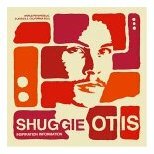 While the soup chills, ponder the enigma of Shuggie Otis. For talent this compelling in its potential, and this frustrated in its realization, Alex Chilton is the only guy I can think of in the neighborhood. Despite the difference in idiom, some of the more fractured moments on this record seem very kindred to those dark moments on 3rd/Sister Lovers, and like Big Star, the more together moments are transcendent. Given that Inspiration Information is an extended repackaging of one of Otis' records, I have to think that there are some pretty dark gems lurking on the un-re-released stuff. Something to keep an eye on as you rummage through the crates. Let soup warm slightly, check seasoning, and add salt and pepper. Serve. Go on down to your local independently owned record store, and buy "Inspiration Information," handsomely reissued by Luaka Bop. If they have to order it, you could use that as a pretext to bring a mix cd for that cute clerk when you go back in to pick it up. But remember, they are already familiar with "Fakebook," so you will have to try harder than that. So much so in fact, that maybe I could bring a smidge to the cute record store girl instead of a mix. Not something to do often, but consider additional examples of Steve Winwood, Eric Clapton.